On December 10, a bunch of local bloggers and sandwich lovers descended upon Pom Pom’s Tea House & Sandwicheria in Orlando for the third edition of #SandwichEatUp. Biggie from Deli Fresh Threads conceived of the meetup because he loves sandwiches and he wanted to meet others who love sandwiches. In fact, he took the group photo above. First off, Pom Pom’s was a great choice as they had a wide variety of sandwiches in many unusual combinations. I ordered a #3 – turkey, ginger-cranberry chutney, cream cheese, smoked gouda and red onion on pumpernickle bread($7) – and made it a combo with a side & tea for an extra $3.50. I chose the side special of the day, spicy mac & cheese, which was like mac & cheese with pico de gallo in it. Other sandwiches ordered included: a 4-cheese melt (your choice of cheeses) with turkey added; a Colassal PBJ (peanut butter, strawberry jelly, marshmallow fluff & banana, though bacon was substituted for banana); a Smoked Salmon (w/bacon, tomato, cream cheese & lemon caper aioli); and several Mama Ling Ling’s Thanksgivings (turkey, gouda, stuffing, ginger-cranberry chutney, mashed potatoes, and cream cheese, with a side of gravy for dipping). All were pronounced very delicious. The teas were very flavorful, as well. I had the special of the day, a blend of Lavendar and Rooibos Tiramisu, which I had sweetened (with honey). Several of us also tried the special Razz Kiwi Saketini drink. It was a nice mixture of sweet and tart, garnished with raspberries and a kiwi slice. The only warning I would give about eating at Pom Pom’s is there isn’t a lot of seating inside, so during busy periods you may have to take it to go. It turned out to be a great evening of good food, drink, and the company of new friends. 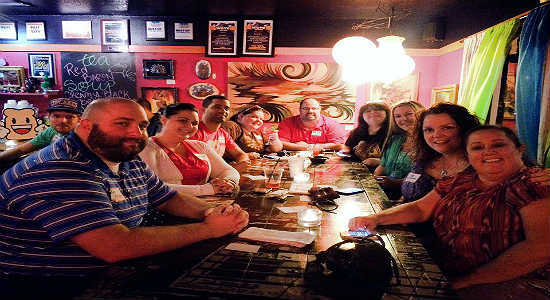 If you’d like to join us at the next #SandwichEatUp, it will be at Black Bean Deli on January 21 from 6-8pm. For more information, follow @DelifreshThrds on Twitter.